Deskin the potatoes & cut into cubes. Cut the aubergine into same size. Deep fry the potatoes & aubergine separately. Heat oil in a pan, add cumin seed, onion, ginger garlic paste, tomato & saute few mins. Add all powders, green chilles and allow it to cook until raw flacour extracts ,add fried potatoes & aubergine. Mix well & Check the seasoning . I am not sure if I can find some eggplants this time of the year but your recipe sounds delicious to make. Quita a delicious recipe Sri! !looks spicy n yummy.. 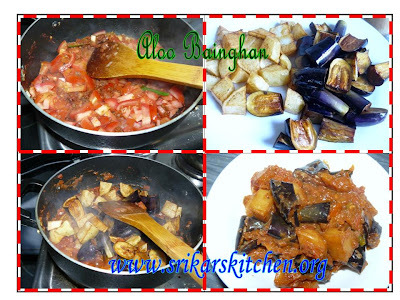 Deep fry eggplants and aloo - wow! This dish must taste super delicious, Sri! Picutre is beautiful! First time @ ur blog! 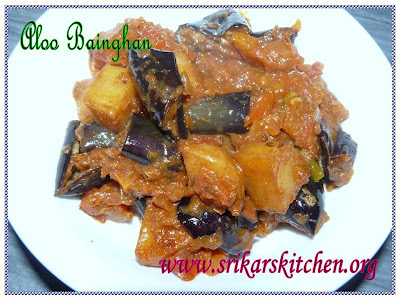 nice recipes...Aloo Baigan looks yum. I know it would taste out of the world. Only wish it were so even without deep frying! Priya,lakshmi,pooja,vani,smitha,preety-- thxs for ur valuble comments..thxs a lot .. I have never tried this combo as subji! Looks very nice!! This is my favourite combo with rotis. Looks yum. delicious recipe.. will sure give a try for my daughter. I love Aloo, Baighan. Looks lovley. Wish i can have right now. Love this combination. Looks delicious..I do the same way but without deep frying.. Delicious recipe, always a winner when you combine these 2 veggies, isn't it ? Dear all, thxs for visiting my site & ur valueable comments..
they are such a perfect combo! looks yummy! I never get tired of seeing eggplant recipes, and how much better can it get with potatoes!! !